According to a recent blog post by OregonForests.org, despite the fact that more people are learning about the natural forest cycle, and that clear cuts mimic naturally occurring forest disturbances such as forest fires, they simply don't like the way it looks. Proper logging practices, including clear cutting in many stands, encourage healthy forests by limiting vulnerability to insects and disease, as well as making them less susceptible to forest fires. Because of these benefits, as well as the commercial need for lumber, clear cutting is not likely to be abandoned. So the question is how to manage the aesthetics of clear cutting? If loggers can make clear cutting more visually appealing, hopefully, it will lessen the general public's aversion to it. One suggestion mady by Oregonforests.org is that loggers should avoid cutting straight boundaries; since straight lines rarely occur in nature, straight clear cut boundaries appear especially intrusive. Instead, if loggers would cut following the natural landscape, it would lessen the likelihood of the clear cut sticking out like a "sore thumb." Another suggestion made to limit the visual impact of clear cutting is to clean up the site at the end of the job. While this seems obvoius, the rugged terrains in which these operations occur often make it difficult and expensive to complete this final step. Alliance and Primex forestry tires are purpose-built to not only handle, but to excel at this type of work. Tires like the Primex LogStomper Extreme are engineered to work on the variable angles that natural landscapes follow. Constructed with a variable-angle lug design, the LogStomper Extreme delivers excellent side hill stability and traction on all types of terrain. 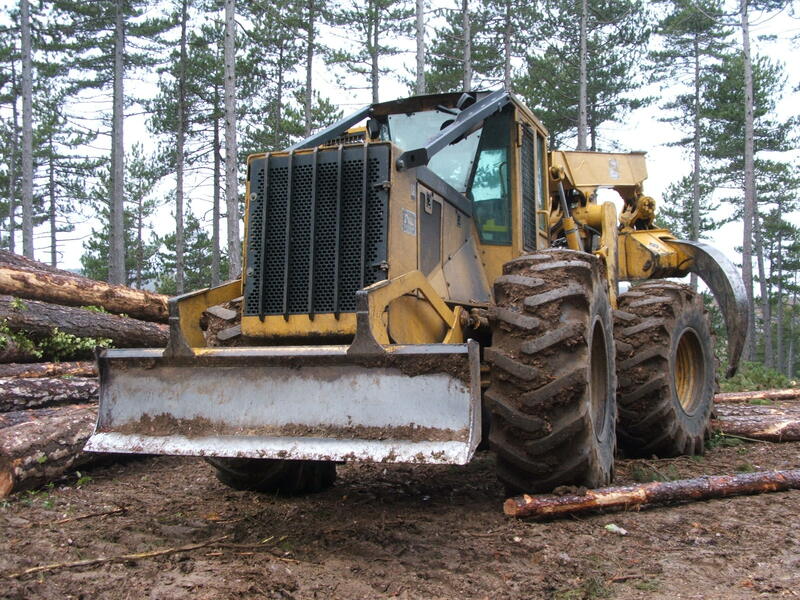 The Alliance 356 Forest is great for use on high-horsepower forestry tractors, and is perfect for helping clean slash piles, trash, and other debris from cut sites. The Alliance 356 Forest is designed for maximum traction, allowing it to follow your operation into the most challenging areas in the forest. Replanting areas that have been clear cut helps ease its visual impact and adds sustainability to the industry by suppressing unwanted species and facilitating the quick regrowth of a healthy forest. A major factor in rapid forest regrowth is minimizing damage to the delicate forest soil. The top layers of the forest floor are rich in nutrients and bio-organisms that are critical to healthy forests. Our Primex LogStomper Super Flotation HF-4 was purpose built to "float" across the forest floor, while simultaneously being able to get loggers’ biggest and heaviest machines into some of the densest, least accessible parts of the forest. Alliance Tire Group is sensitive to the needs of both loggers and the public—after all, a logger’s job is a lot easier and more secure with public support. We realize that while some of these methods can add additional time, thought, and expense, they are good for the sustainability and perception of the industry. While no-one likes to incur extra cost, ATG can help put a little money back in your pockets. With our tires’ well-deserved reputation for low Total Cost of Ownership (TCO), you get more hours and less cost per tire. Additionally, Alliance and Primex forestry tires pride themselves on delivering all the performance of our big-name competitors. For more tips like this, check out past Forestry Industry articles listed on the “Posts By Topics” section of our website and be sure to sign up for our mailing list!